The lack of recognition of Romani gender politics in the wider Romani movement and the women’s movements is accompanied by a scarcity of academic literature on Romani women’s mobilization in wider social justice struggles and debates. 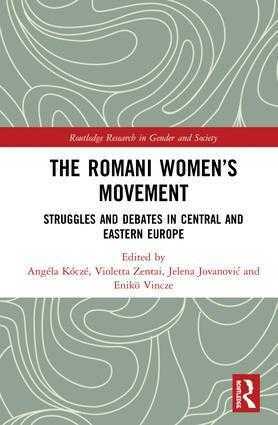 Published in summer 2018 by Routledge, “The Romani Women’s Movement: Struggles and Debates in Central and Eastern Europe” highlights the role that Romani women’s politics plays in shaping equality related discourses, policies, and movements in Central, Eastern and Southeastern Europe. Presenting the diverse experiences and voices of Romani women activists, this volume, co-edited by Angela Kocze, assistant professor of Romani Studies at CEU, Viola Zentai, director of the Center for Policy Studies at CEU, Jelena Jovanovic, policy and research coordinator of the European Roma Grassroots Organizations Network, and Eniko Vincze professor at Babes-Bolyai University, reveals how they translate experiences of structural inequalities into political struggles by defining their own spaces of action; participating in formalized or less formal activist practices and challenging the agendas and mechanisms of the established Romani and women’s movements.